Most greenhouse crops are suitable for usage of Dalotia, including vegetables, ornamentals, pot plants, and propagation areas. They prefer a warm, humid environment, but will adjust to a variety of crop situations and media. They are particularly useful in cocopeat and capillary matting, and the ends of hydroponic guttering where algae grow and shore flies, moth flies and other nuisance flies breed. It was originally developed as a biocontrol agent in Canada, and was discovered to be naturalised in many other countries, including Australia. Adult Dalotia coriaria are 3-4 mm long, glossy dark brown to black, elongate beetles. The upper wing covers are short, exposing the segmented abdomen. The clear lower wings are unfolded when the beetle flies. It is this capability which makes Dalotia very mobile and a good coloniser within the greenhouse. 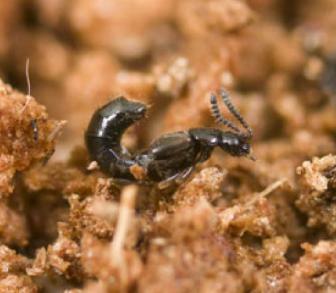 A characteristic of rove beetles is that the adult curves its abdomen upwards like a scorpion when running or disturbed, but it is harmless to people. Small white eggs are laid into the growing medium. They hatch into pale larvae, which go through three growth stages which become a darker yellowish-brown. Larvae are also highly predaceous. Pupae are rarely observed, but are encased in a silk net woven by the final larval stage. Storage and handling: Transport and store in darkness at 10-15°C. Dalotia is best used as soon as it is received. If necessary, containers may be held at 10°C for up to 7 days. Release method(s): Dalotia should be released within the greenhouse during the cooler part of the day, by sprinkling the mix in small heaps onto moist media targeting areas where prey is known or likely to be present. Release evenly, but as beetles can fly distribution is not as critical as releasing predatory mites. Timing of application: Due to its mobility and high consumption rate, Dalotia is best released when target pests are known to be present, or adults may leave the greenhouse to forage elsewhere. Release rates: Apply at a general rate of 5 beetles/m2, and 10/m2 in hot spots. To ensure mating, release in batches of 50-100 beetles, in the centre of the greenhouse and in wetter areas likely to breed shore flies and fungus gnats. A second release is usually recommend 1-2 weeks later to ensure good establishment.